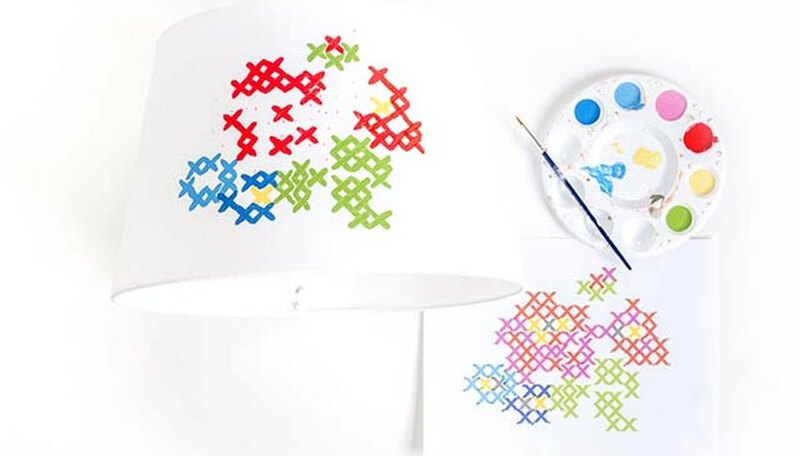 Add customized color and texture to a plain white lampshade by using paint to create the illusion of a cross stitched flower. 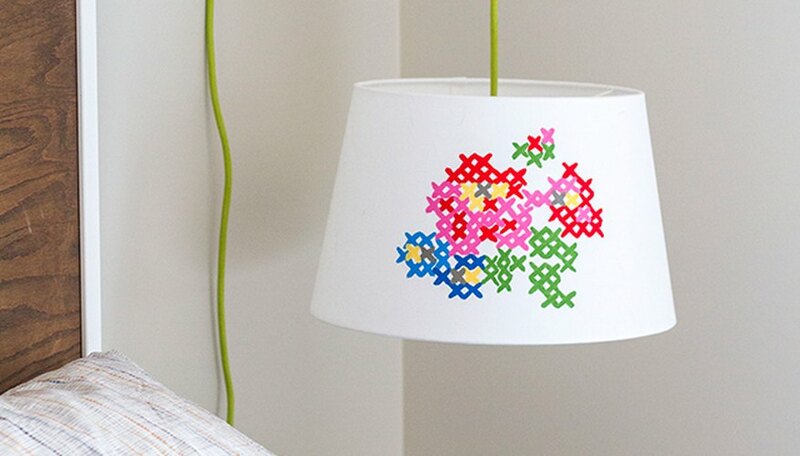 Using a printable flower template as your guide and fabric paint as your medium, you can achieve the effect of a hand-sewn cross-stitch design on a lampshade without the hassle of a needle and thread. This project takes just one hour of hands-on time to complete. Using the wire cutters, cut off a 2-inch piece of wire from the spool of floral wire. 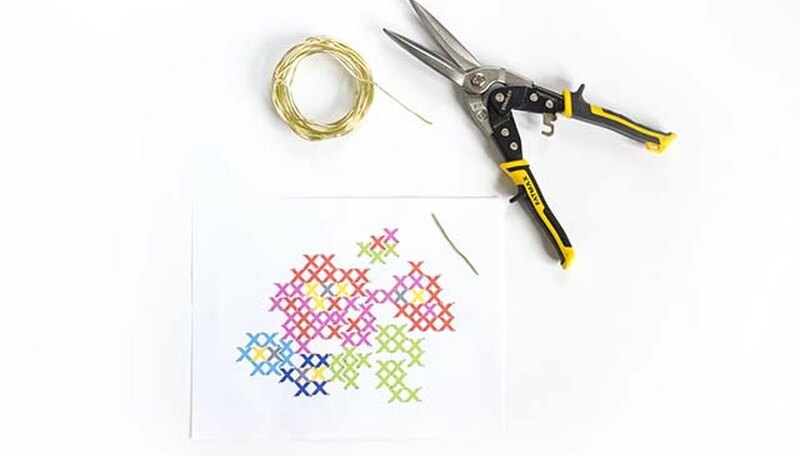 Straighten out the piece of wire between your fingers and then position one end over the top left point on the first X shape in the cross-stitch template. Gently push through the paper with the wire to form a hole. In case you don't already have floral wire on hand, a large needle or pushpin would suffice for this step. You may need to wiggle the wire around in a circle to open the hole wide enough to see through. 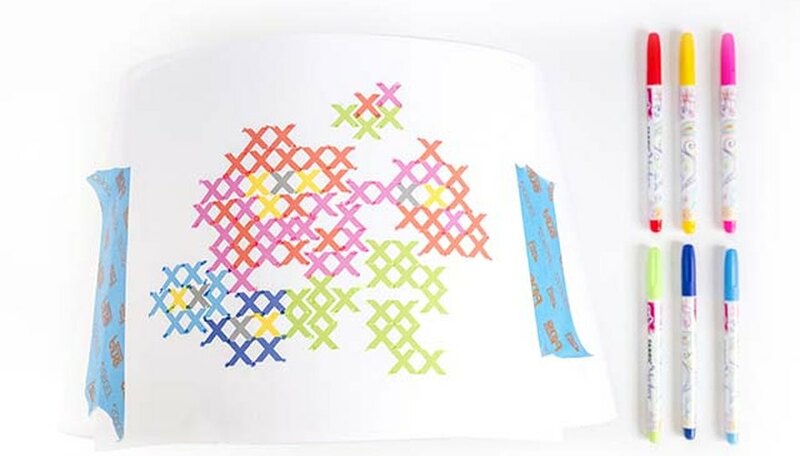 Continue poking holes in the paper, four holes for each X shape (two at the top and two at the bottom), until all of the Xs are marked with a hole. When you come across a row of Xs and the points meet at the sides, just poke one hole through the Xs where they meet. It's easiest to punch holes through the paper when you position the template over a soft surface, that way the wire has something to go into rather than being stopped by a solid surface. 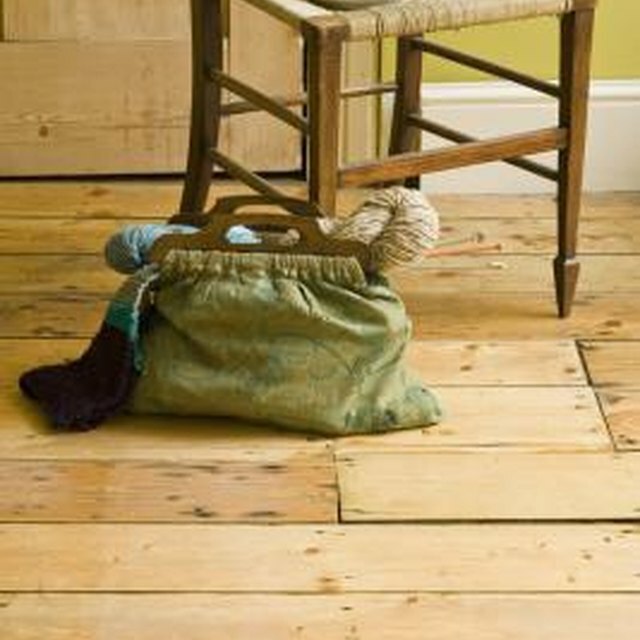 High-pile carpeting actually works really well for this, as does a piece of soft, thick cork or cotton batting. Tear off two pieces of painter's tape and attach them to the outside edges of the paper template. Pick up one of the fabric markers and then correspond the color of the marker to the color of the particular X you need to mark through. Make a light dot through the poked holes in the template onto the lampshade. Repeat the step with all seven colors. If you come to a hole where two colors meet, mark first with one color and then mark over it with the other so that the colors blend together slightly. In the next step, you'll use the printed template as your guide to match up these colors if the fabric marker dots get confusing. Gently remove the taped template and set it to the side of your work area. Squeeze small amounts of each of the seven colors of fabric paint into separate compartments or edges of your plastic paint tray, and dip your paintbrush into the first color. Then, slowly work your way over the lampshade, connecting the marker dots with paint. Correspond the color of paint to the color of the marker dots now visible on the lampshade. If you get confused, use the printable template as your guide to confirm the placement of your colors. Start with one color, paint out the Xs, clean your brush and paint another set of Xs, this time in a different color. 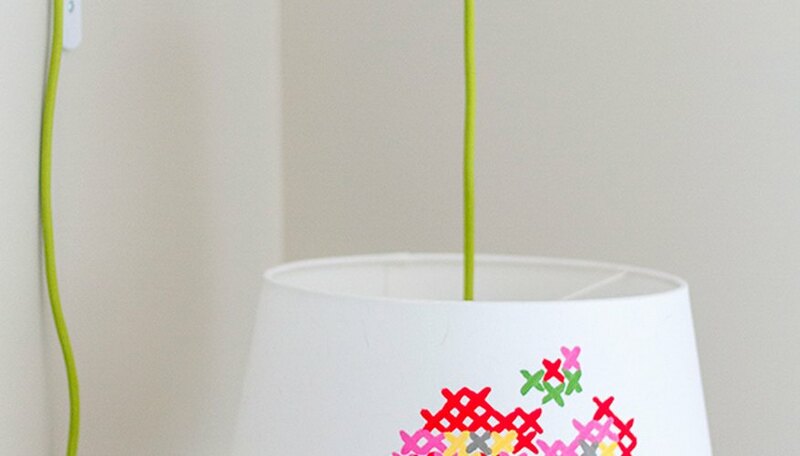 Continue working your way over the lampshade until you finish the flower design. Allow the paint to dry for one hour, and then paint a second coat if needed. When you finish your final coat of paint, allow the lampshade to dry for two hours before handling. Then, hang or install your finished faux cross stitch lampshade. To get the details on how to install a hanging side lamp like this one, click through to [Dream Green DIY](http://www.dreamgreendiy.com/2015/03/13/diy-ikea-bedside-lamp/).